NASCAR fan Aaron and his wife, the winners of the Credit One Bank Ultimate Race Weekend sweepstakes, pose with Jamie McMurray, driver of the No. 1 Chevrolet at the Kobalt 400 in Las Vegas. 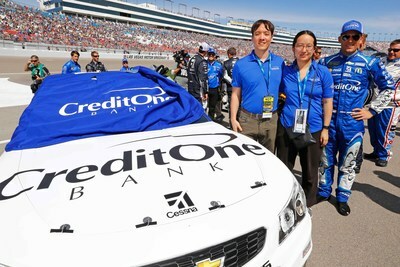 LAS VEGAS, March 15, 2017 /PRNewswire/ -- Credit One Bank, the Official Credit Card of NASCAR and one of the largest and fastest growing issuers of credit cards in the United States, recently awarded the Ultimate Race Weekend to a lucky NASCAR fan and his wife. In January, NASCAR fan Aaron R. from Grapevine, TX won the Credit One Bank Ultimate Race Weekend sweepstakes, which included two tickets to a 2017 Monster Energy NASCAR Cup Series® (MENCS) race of their choice, a VIP experience and behind-the-scenes tour, roundtrip airfare, hotel accommodations and $1,000 spending money. Aaron and his wife Jacki selected the Kobalt 400 in Las Vegas, NV where they had the opportunity to meet Jamie McMurray, driver of the No. 1 Chevrolet. "It was a fun filled, action packed weekend," said Aaron R. of his first time attending a NASCAR race. "Experiencing all that NASCAR had to offer opened a new and exciting world!" Race fans were eligible to enter the sweepstakes from mid-October through Dec. 31, 2016 by visiting CreditOneBank.com/NASCAR to see if they pre-qualified for the Official Credit Card of NASCAR. All existing Credit One Bank NASCAR Visa primary card members automatically received one entry into the sweepstakes. "We can't think of a better way to kick off our second season as a NASCAR partner than by hosting Aaron and Jacki at the Ultimate Race Weekend," says Laura Faulkner, vice president of marketing communications at Credit One Bank. "Through this sweepstakes, thousands of NASCAR fans have experienced how easy it is to apply for the card that allows them to show their passion for auto racing and rewards them for being a fan." In its second season as an official NASCAR sponsor, Credit One Bank has also expanded its relationship with Chip Ganassi Racing by partnering with Kyle Larson and the No. 42 team during the inaugural Monster Energy NASCAR Cup Series season. "We are excited to grow our support this season and cheer on Kyle Larson," Faulkner continued. "We look forward to another great season of racing." Credit One Bank, N.A. is a U.S. based national bank that specializes in credit cards. Credit One Bank is one of the largest and fastest growing issuers of credit cards in the industry and provides a broad spectrum of credit card products. Credit One Bank offers its card members cash back rewards, credit education tools, and free online access to their credit score each month. For more information, please visit www.CreditOneBank.com.